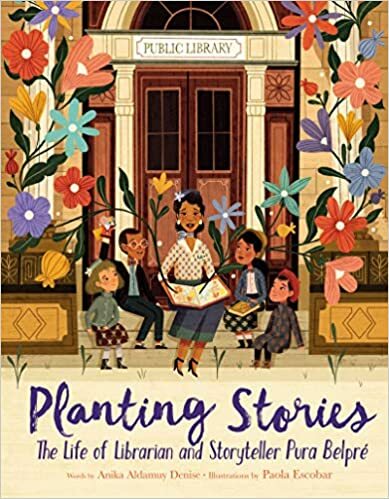 Written by Anika Aldamuy Denise and illustrated by Paola Escobar, Planting Stories: The Life of Librarian and Story Teller Pura Belpré (2019), is an exceptional biography of New York City’s first Puerto Rican librarian. In addition to accessibly and inventively capturing Pura’s story, the book provides a window into US history. It is also a timely tale of Arts-based activism that speaks to ongoing struggles to secure equal access to cultural representation.Pura Belpré moved from Puerto Rico to New York City in 1921. After a brief stint at a garment factory, she was hired by the New York Public Library because of her ability to speak both English and Spanish. Pura was responsible for creating programs for the Spanish-speaking community the library served. Pura soon realized none of the stories passed down through her family were present on the library’s numerous bookshelves. Once Pura noted the absence, she sought to fill the void and bring the stories of her culture and childhood to life for children. She did this on a small-scale through story time for local children. Additionally, she became a published author, bringing the stories of her childhood to life for readers beyond the New York Public Library. Author and illustrator linger on one story, Perez y Martina, about a dignified cockroach named Martina finding love with a debonair mouse named Perez. Illustrations scattered throughout the text depict the couple. In one image, Pura performs the story with handmade puppets she created. Even more, Martina and Perez are depicted hovering in the air above Pura as she meets her future husband, the musician Clarence White. The presence of Martina and Perez’s fantastical romance gives the realistic biography an underlying quality of whimsy young readers are sure to appreciate. Readers will also enjoy the vivid, crisp, and colorful illustrations, which must be read alongside the words to appreciate the full meaning of the story so elegantly spun by author and illustrator. This is an extraordinary celebration of Pura Belpré’s life. It will make a delightful and meaningful addition to classroom and personal libraries, as well, of course, as public libraries.